Where should I start? The beginning perhaps? Ok lets give that a go. 0540 the alarms go off. Unfortunately I could not turn it off and ignore it. Was the morning of the 3 dams and if I wasn’t at the Bell Tower by 7am I’m sure Geoffrey would have killed me. After a quick shower to wake-up had just enough time for a bite to eat. I was thinking oh dear. I haven’t carb loaded enough for today. So I topped myself up with my normal two slices of toast. After tweeting that I was awake it was time to shave and get dressed. While getting kitted up I noticed I had broken the lens on my sun glasses so I added the yellow lens to my saddle bag. After getting dressed and stuffing my jersey pockets with the most junk I have ever take on a ride before was time to roll out. As I clipped in and started heading up the hill towards the train I realised what a great morning it was. Very little wind. My ride to the Bell Tower was very un-eventful and was very little traffic on the cycle path for a Sunday morning. My warm-up hill was East Perth past the police station. Was this point I realised the extra weight I was carrying today. Got all green lights on the other side down to River Side Drive. Upon arriving at the Bell Tower I made my way zig zagging through all the others milling around. Did not see Geoffrey until I gave up looking. The giant then appeared from the darkness. 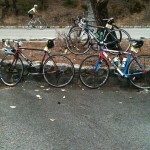 While Geoffrey went and got out ride kit I saw Carlos and Megan. After getting run over by a car the day before Carlos was looking pretty good. They told us to catch them up and we would ride together. Well that didn’t sound to hard. This was the last we saw of them all day. They must have been packing after burners. Heading out along Great Eastern Hwy we saw a pair of riders who looked like they needed a hand so we took the lead. Soon after they re-took the lead so we let them hang out there until we past the airport. Then we got in front and Geoffrey decided it was time to catch the group in front. So being the Trojans we are we caught the group in front. This turned out to have been a waste of energy because the group got a flat and pulled over. Never mind there was another group and now the giant wanted to catch this one also. So we picked up the pace again. This time we caught them and happily sat on the back up until Greenmount. I don’t know what Geoffrey was fed the night before but he had the energy today and soon got bored of taking it easy up the first hill and started pumping out a tempo and picking riders off one by one. I also managed to keep a good tempo going today and stayed in the saddle all the way up. By the top I knew I had done a good job and not finished too far behind Geoffrey. I mentioned to him that I think that was my best climb. I was correct. PR according to Strava.com. By the time we got to the top of Greenmount it was spitting rain. This continued all the way to Mundaring Dam. I took the descent carefully. I did not want to have the bike jump out from under me. The Giant however seems to have no fear of crashing. His day will come. We arrived at the first checkpoint. 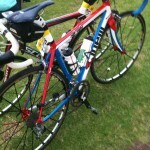 After getting checked off and topping up water bottles was time to get back on the bike. After a quick photo from the photographer it was time to climb Mundaring Weir Road towards Kalamunda. Time to take on a power bar so it would kick in through Carmel and Canning Road. 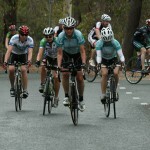 On our transition between Mundaring Weir Road and Canning Road we saw our SPR buddies doing there long hills ride. You would think it was Saturday morning all over again. They were Yelling at us and I was yelling at them to pick up the pace. Far to slow for my liking. I prefer doing this section the other way. Going backwards has far more uphill than downhill. Canning Road allowed us to get the pace back up into the high 30s low 40s. After a quick stop for a water bottle top up at the servo on the corner of Brookton Hwy and Canning Road it was back on the road. This is where I took down gel number one. Legs were flaking a little here so was glad when the Gel kicked in. After turning off Brookton Hwy we did not see any other pairs of riders until we got to Canning Dam. All I remember of this section is the constant gear changes. Up, Down and all over the place. The road was rough and I could not find a gear I was comfortable in. Next we found ourselves arriving at Canning Dam where we got a chance to catch up with a couple more SPR crew. Still no Megan or Carlos. Leaving here was a mother and father of a hill. I was so glad to crest this one. It was the thought that only one more dam to go that got me up it. This was a surprise because after a short trip down Albany Hwy the sign at the left hand turn said Wungong Dam 3 kms. I couldn’t believe we were almost done. On the way down to the dam a guy caught us up who had a busted rear derailure. I have no idea how he was riding with a chain that would serve better as a necklace. On the descent to the dam Geoffrey went flying off ahead. I was enjoying the downhill because I thought we had to climb this cruel hill again. But I was wrong. We only stopped for around 20 minutes and had lunch. A quick snack and then back on the bike for the ride back to Perth. The climb out of the dam on the other side was no fun. But I was telling myself this was the last climb. Geoffrey went for it down Albany Hwy and we ended up bring a large number of riders onto a group down the road. Once we reached this group we sat on the back of it all the way up to the Freeway. A couple of old guys did a lot of work on the front and I tapped one on the back at the lights and told him great work. I didn’t realise his age until I caught up to him. From here only Geoffrey and I plus the two old guys did any work on the front back to Perth. This was a hard slog. I think Geoffrey and I did most the work leading this group back to Perth. We sat comfortably on around 40kph all the way down the freeway and just a couple of kms or so before Perth I waved the old guys past to finish us off. I and Geoffrey were done now. We actually crossed the finish line at around 43kph at 1pm on the dot apparently. 06:38:49 h:m:s position 53 and that made us 25.73% mark within the field. Was glad to be finished but next year 5 dams it is. I am sure this time next year I will be regretting this comment. I must thank Geoffrey for begging me to do this. Glad I can tick this off my list of things to do.